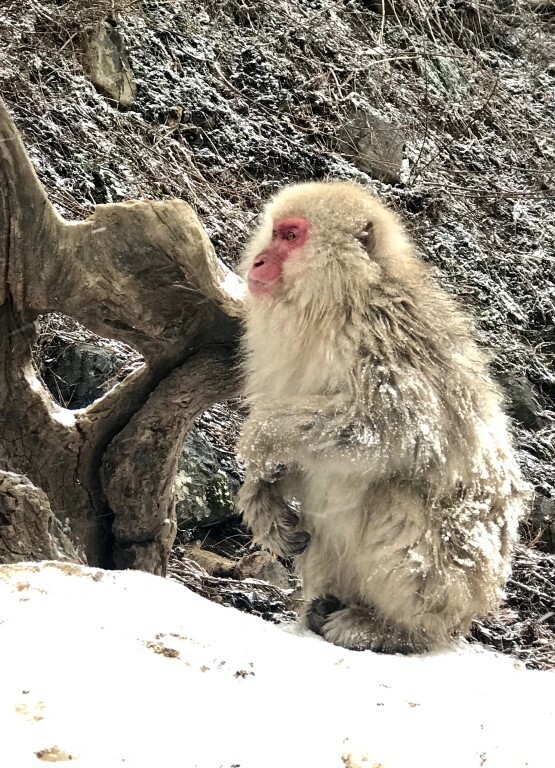 I had been visiting the business in China (Shanghai) all week and next week I have to be in Tokyo to visit the Japan business so a colleague (Stacey) and I decided to spend the weekend in between in Yudanaka, Japan visiting the famous Snow monkeys. 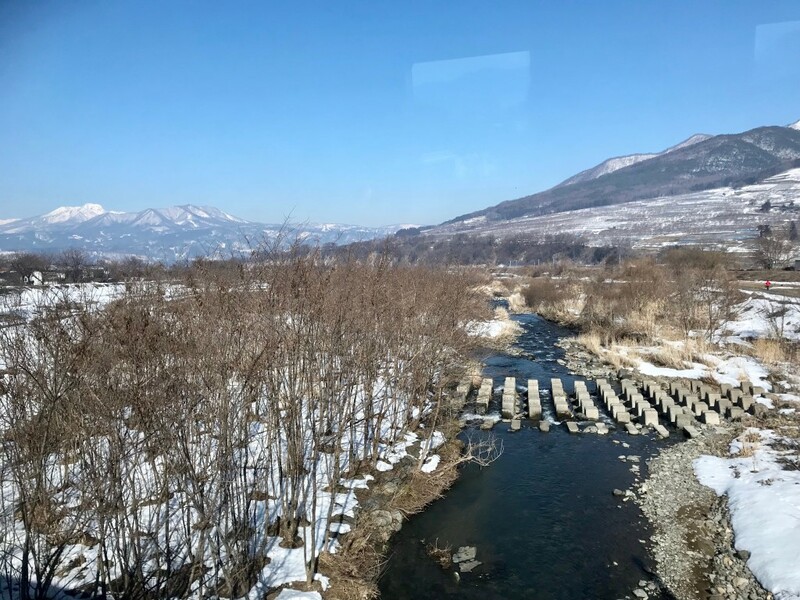 We flew from Shanghai to Narita on Friday afternoon and then caught the Narita Express train to Tokyo, then the Shinkansen (bullet train) to Nagano and the Snow Monkey Express to Yudunaka, eventually arriving at about 11:30pm. 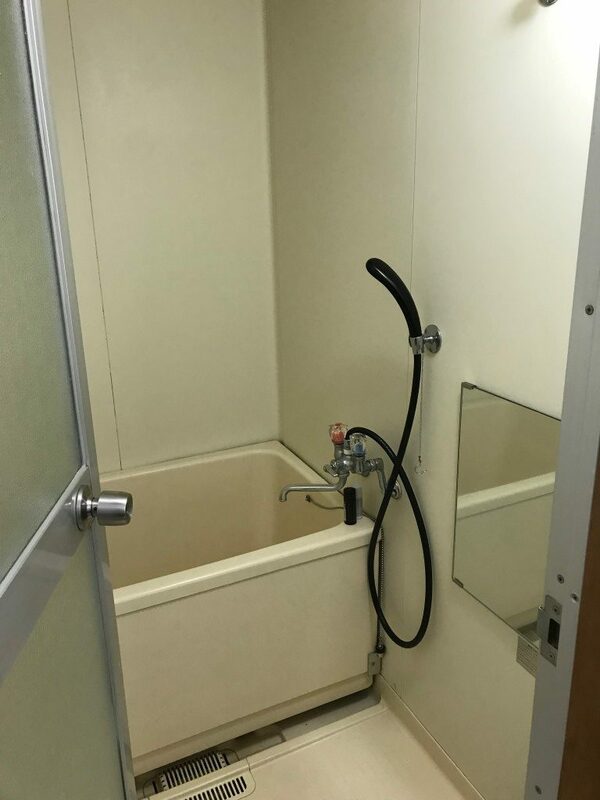 Like everything else I have encountered in Japan, the trains here are clean and efficient. We were met at the Yudanaka station by someone from the small hotel we were staying in and transferred to the hotel. 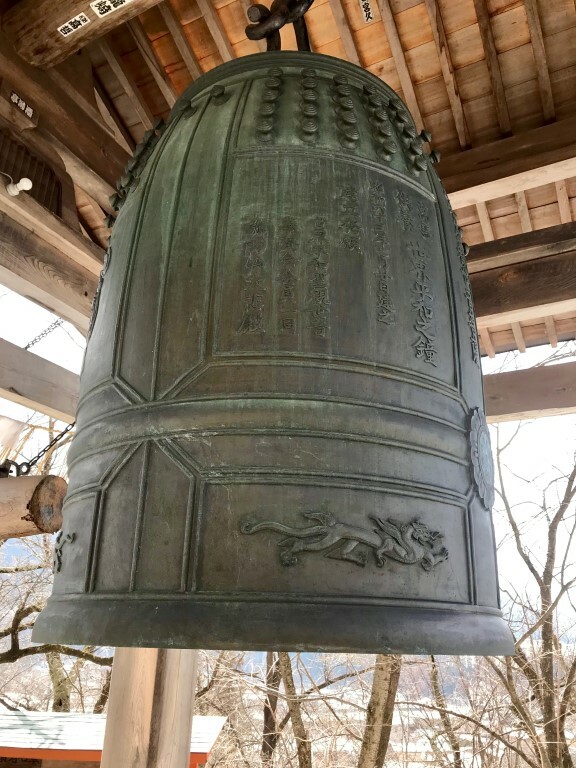 I have to briefly comment on the incredible communication and service we received from the Bosanzo Hotel – they could not have been more helpful or accommodating. Check in was very smooth and they offered to drive us to the Monkey Park on Saturday morning. Yudanaka is a pretty small town to the west of Tokyo near the ski area. Most of the people we saw on the train seemed to be heading there for skiing. The hotel was one of the few in the area that offered real beds, not just futons. 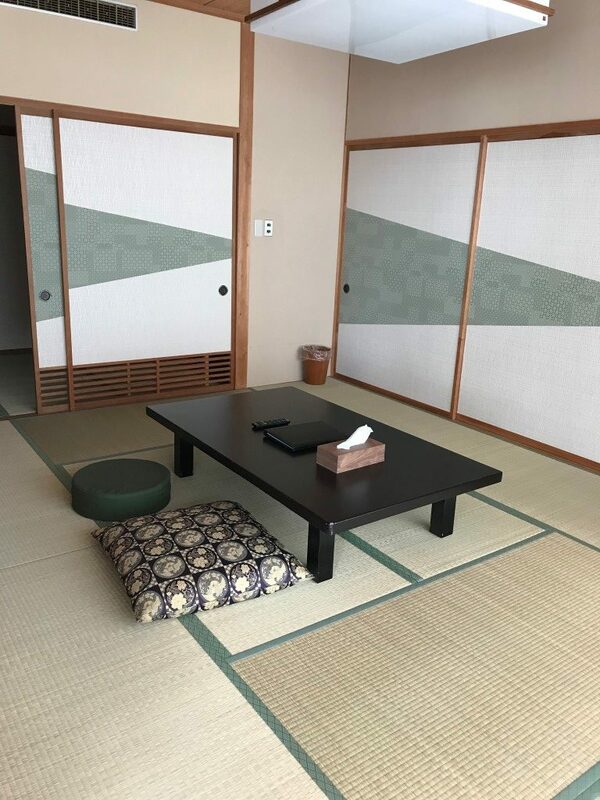 Still when I unlocked the door and walked in all I could see were tatami mats and I had a moment of concern until I spied a sliding panel and found a small bedroom. I did have a bit of a giggle at the rather incongruous placement of the mirror in the bathroom. Even after a whole weekend of trying to figure it out I cannot fathom why one would want a mirror a foot off the floor?!? 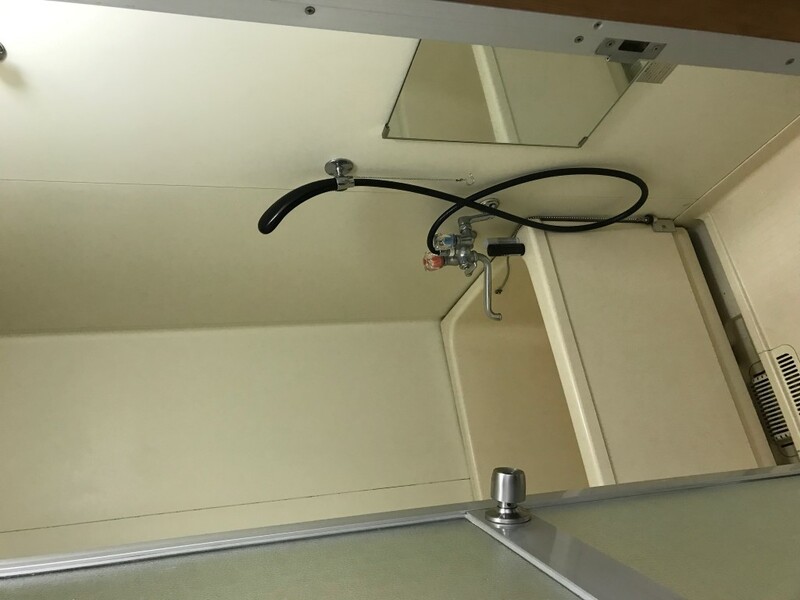 The hotel provided a Japanese style breakfast and we were faced with an array of dishes including rice, salad, miso soup, boiled egg, miso fish, mushrooms etc. Despite all my travels in Asia I have to say I still prefer a western breakfast. After breakfast we were driven the 4 kms or so to the Jigokudani Monkey Park. It was bitterly cold and snowing lightly as we headed up the 1.7km path to the monkeys. Despite arriving not long after opening we passed many other tourists on the way. 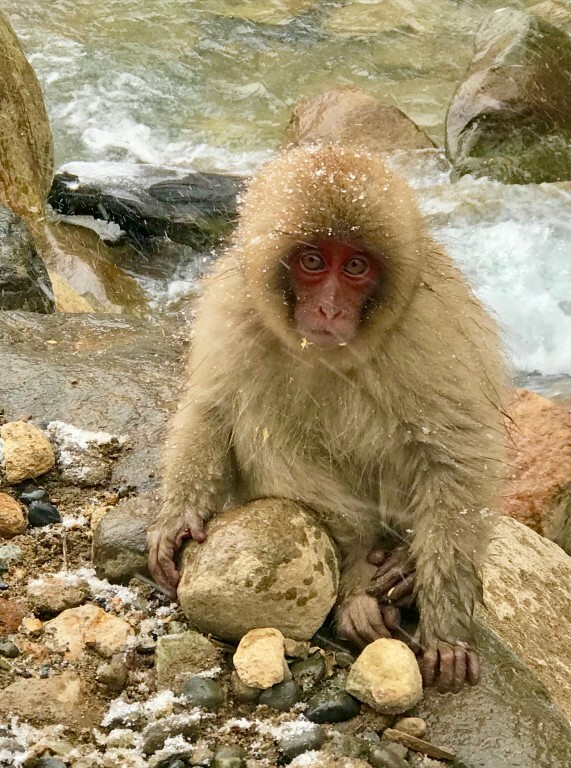 Well before we reached the park entrance we spotted monkeys in the snow on the other side of the stream that ran through the forest that we were gradually climbing in. Tickets purchased we rounded a corner and there were monkeys everywhere. 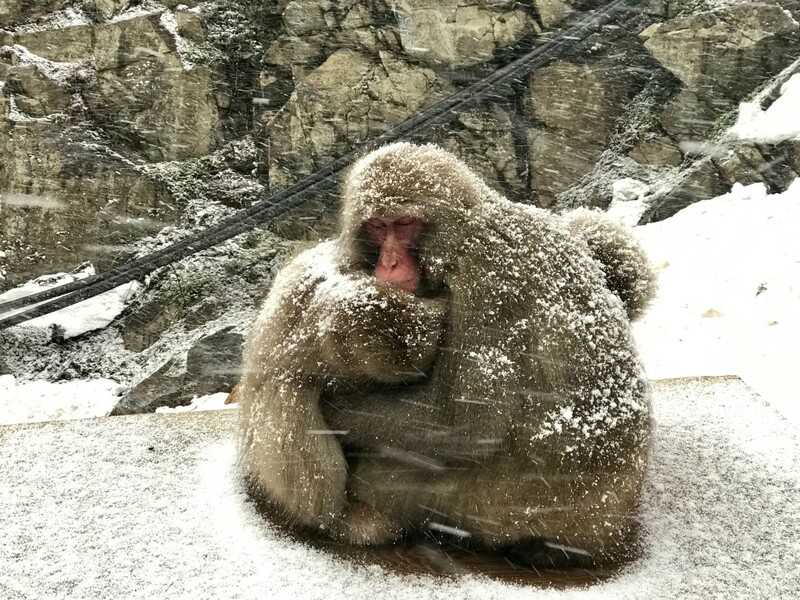 These Japanese Macaque monkeys are the northern most species of monkey in the world and survive in freezing temperatures. 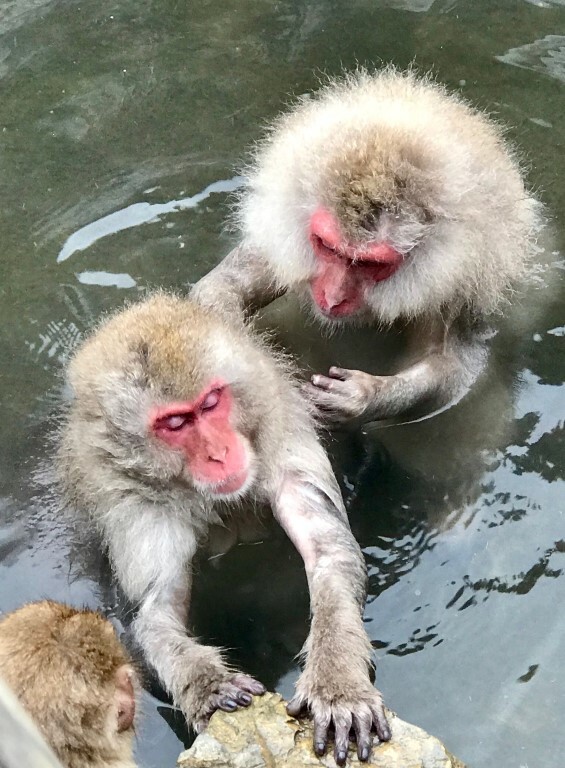 The park sprinkles food to provide incentive for the monkeys to stay (which encourages them to not bother the locals and therefore protects them from negative repercussions) but otherwise the monkeys are wild and are free to come and go as they please. They are clearly very used to being surrounded by people and seem completely oblivious to us. 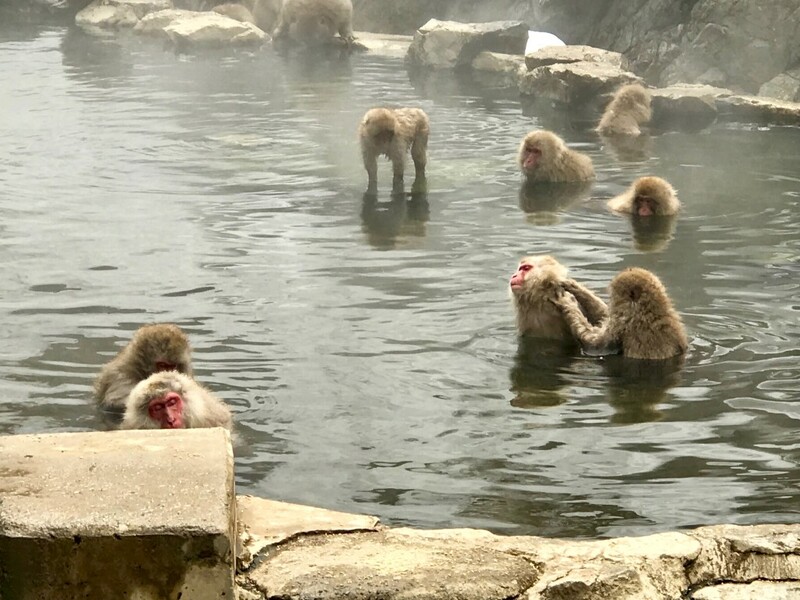 Some huddled against the cold in small clusters, others played and foraged and several soaked, swam or groomed each other in the hot pool this area is famous for. 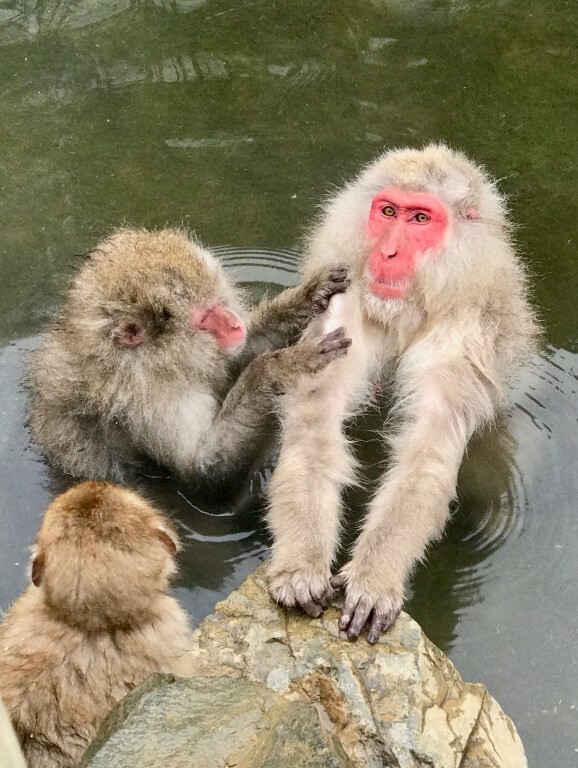 It was funny to see their normally pale pink faces turn almost red with the heat of the pool. 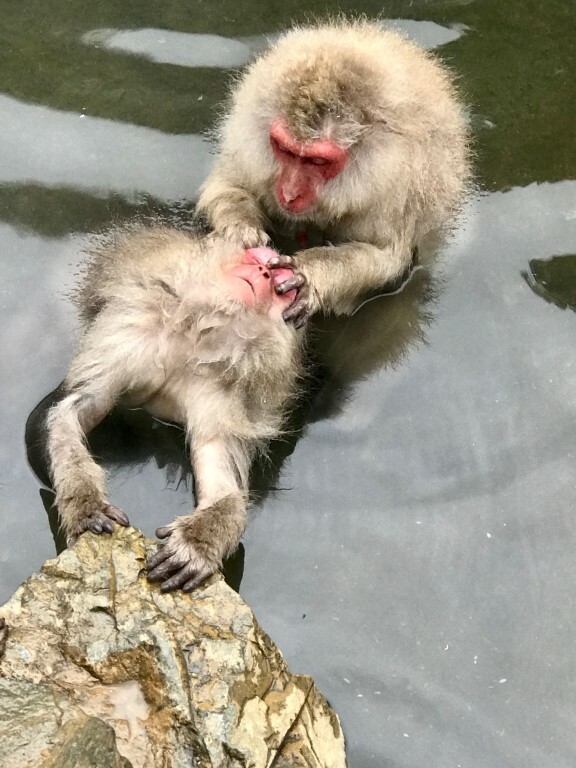 This is obviously a favourite spot for grooming and they looked to be really enjoying the experience. Their hands are so human like it is really incredible to watch them. After a while the cold got too much and we headed back to the ticket office to thaw out before wandering back down the hill. From the entrance we caught a bus to Shibu Onsen, a small traditional Japanese village that has several Ryokans (Inns) and Onsens (Thermal Bath houses) and is clearly a popular place for people to stay, although we barely saw anyone while we were there – I suspect they all head up the mountain during the day. It would be interesting to visit during the evening and see how different it is. 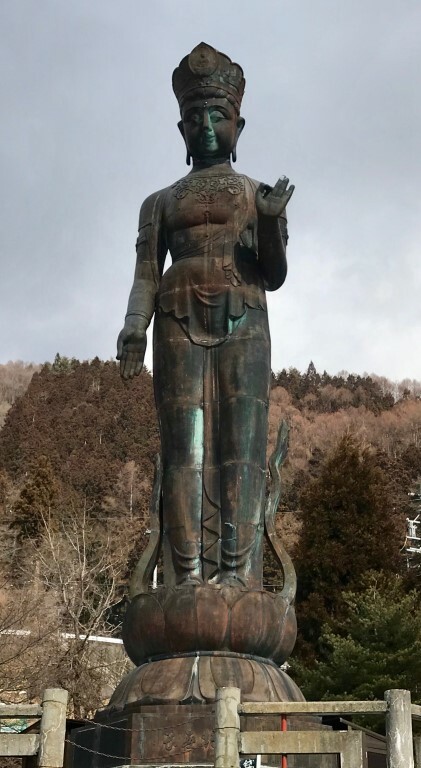 We wandered through the town then back towards Yudanaka, stopping briefly to look at a large Buddhist statue and monastery. We spent the rest of the day catching up on work and rest and then enjoyed a lovely Japanese meal in a small restaurant in the town. After another Japanese breakfast we headed back to the station and retraced our steps to Tokyo. It was great this time to be able to do the trip in daylight. It was a gorgeous sunny day and the snowy mountains made a magnificent backdrop to the agriculture and housing. 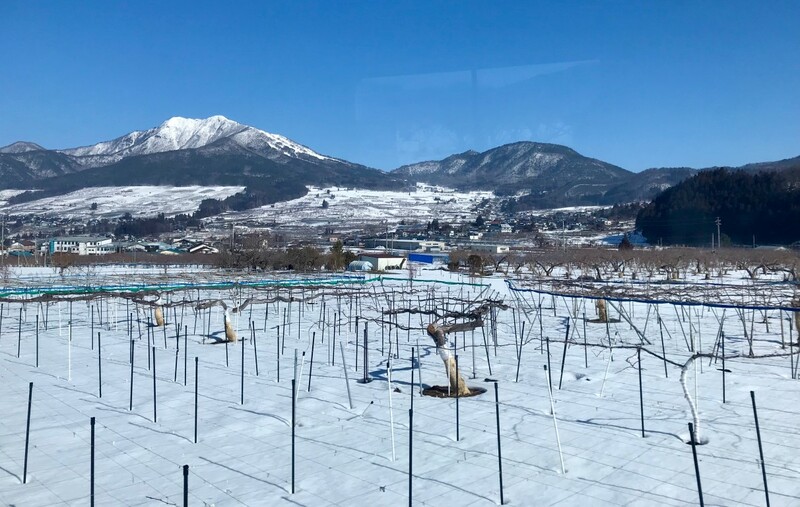 It seems that they use every piece of land in this heavily populated country and this area is particularly well known for its apples so we passed orchard after orchard, all groomed and staked for maximum efficiency. hello Sylvia..another fabulous read..I do envy your wonderful travels!!!!!!! 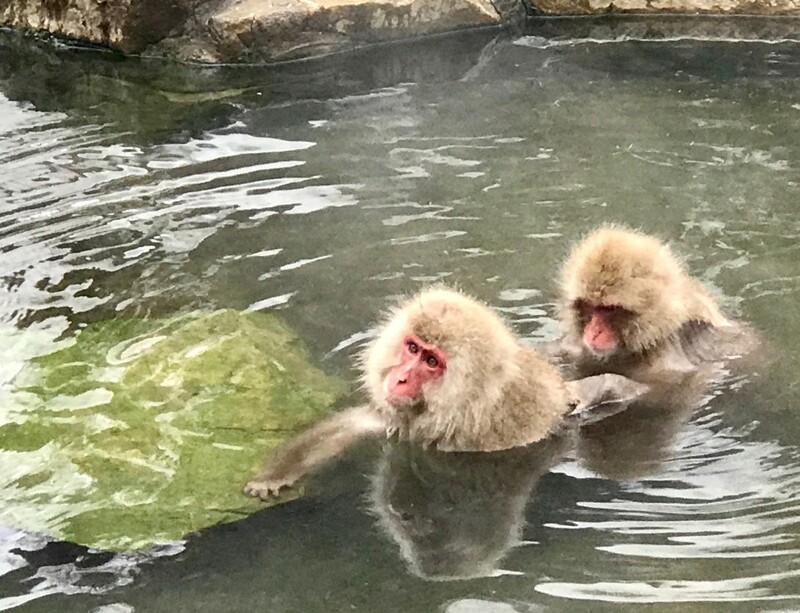 Fascinating to see the monkies….comical how they blush in the hot water.